The International Criminal Tribunal for the former Yugoslavia has cleared Serbia of genocide or complicity in genocide in Bosnia. The ruling has caused anger among Bosnian Muslims worldwide. It's been 14 years since Bosnia submitted its genocide case to the United Nations' highest court. For the first time, an entire nation has been held to account in court and acquitted. The World Court cleared Serbia of genocide in Bosnia in the early 1990-s, but found it guilty of failing to prevent the massacre of 8,000 Bosnian Muslims at Srebrenica. “The Yugoslav Federal Authority should, in the view of the Court, have made the best effort within their power to try and prevent the tragic events then taking shape whose scale, though it could not have been foreseen with certainty, might at least have been surmised. 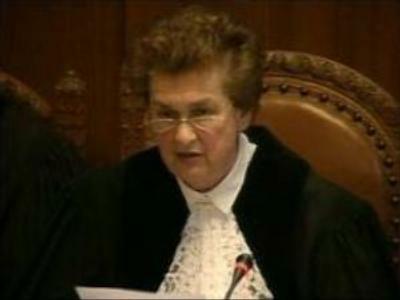 It must have been clear that there was a serious risk of genocide at Srebrenica, yet the respondent has not shown that it took any initiative to prevent what happened, or any action on its part to avert the atrocities which were being committed,” stated judge, Rosalyn Higgins. The decision caused mixed reactions. A crowd of Bosnians gathered outside the court to express their dismay at the ruling. Relatives of those massacred in 1995, said they will continue to fight for justice. “Look at the gravesite. We did not bury bricks there. These are our sons, husbands, brothers. I accuse the, I accuse them, both Serbia and Montenegro and the Bosnian Serbs too. As a mother and as a sister I promise them that I will fight until the end, because I know they are guilty,” said Sabra Muic, a relative of Srebrenica victims. Bosnia announced its independence in October 1991. Serbia was struggling to preserve the territories in Bosnia and Herzegovina primarily inhabited by ethnic Serbs. Serbian leaders feared the Bosnian enclave of Srebrenica threatened the territorial integrity of their country. Mutual ethnic killings were commonplace. The situation reached its peak in July 1995 when more than 8,000 Bosnian Muslims were slaughtered in a matter of days. 400 Dutch peacekeepers sent to the area a few months earlier failed to prevent the tragedy. The killings have marred relations between Serbia and Bosnia and Herzegovina for years. But some people think it is only Serbs to put blame on. “I would like to underline that in Srebrenica in 1995 a heinous crime took place. Can it be qualified as genocide? I don't think so. But it would be one-sided to put blame only on Serbs. There were victims on the Muslim side, at the same time over ninety villages with Serbian populations were slaughtered […]. I think that this event should be thoroughly investigated and it is important to understand that there was a crime from Serbian side, but not only from them. It could be a good base for the peoples' reconciliation,” believes former Yugoslav Ambassador to Russia, Borislav Milosevic. The formal end in the case of genocide against Bosnians has been voiced, but the controversy around Europe's largest mass murder since the World War II remains strong. Human Rights Watch says it sends a strong signal to other states that may be involved in genocide.